Molly’s Mill is a must-visit. You may remember the Head Chef Dean Coppard from the multi-award-winning Uluru in Armagh. Like all Taste of Ulster members, he sources the best local produce for all his menus. He gets his meat from Carnbrooke and his seafood from Keenan’s. The Mill Bar offers a wide selection of hearty pub grub to satisfy all tastes. The exposed red brick and fresh décor provides the ideal setting to try their varied bar snack menu or even just enjoy a pint of local ale. Lunch is served from 12-4pm and there are bar snacks by the fire between 5 and 8 pm. Molly’s Tea Rooms is just the place if you fancy one of their amazing Afternoon Tea packages. Enjoy this while sitting in front of their wood burning stoves or in their beautiful conservatory. 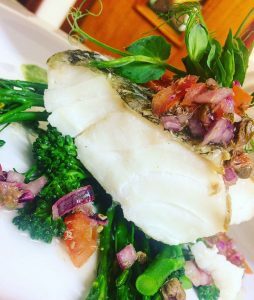 Evenings are more fine dining in Molly’s Restaurant with the menus changing with the seasons to make use of the best local fresh produce. Try their garlic buttered Portavogie prawns on toast followed by Begny Hill Sugar Pit Pork Chop – it’s mouth-watering. Their specials boards are creating a bit of a stir with Smoked Swordfish and Tynedale Goat just some of their recent dishes. Make sure to try one of their delicious cocktails from their extensive drinks menu – so many reasons to go.